The Bills seemed to have found quite the player in Robert Foster. For the second time this year, a Bills receiver went over 100 yards. Foster was the first against the Jets earlier this year, as well. Today, Foster had 7 receptions for 104 yards. It will be interesting to see how Foster will fit in once the Bills fill in their receiving unit with some top-tier talent through the draft and free agency, but at least for the time being Foster is reliable and has great on-field chemistry with Allen. Another diamond in the rough find for the Bills, who made it a point to add speed to the the unit about halfway through the year. Outside of McKenzie and Foster, there was not much going for the receivers today. He finished with 4 for 47 through the air. McKenzie also added a score on the ground with a fearless 15 yard touchdown run in which he looked determined to score. Every time Chris Ivory hits a hole and rips off a decent chunk of yards, I believe McCoy’s chances to be on the roster next year dip slightly. It is well established by now how bad this line is, but if Ivory can come in and hit a small window and come out a game averaging 3.5 yards per carry, then why can’t McCoy? Ivory seems to make the most of his runs in this offense, while McCoy doesn’t. I love Shady and I want him here, but something is not right with him this year and I think Beane and McDermott realize that it may be more than a below average offensive line. The first quarterback in the Super Bowl era to have 100 yards rushing in back-to-back games. And it really is 3 straight if it weren’t for his kneel downs at the end of the Jacksonville game. The last three games are 99, 135 and 101. Simply incredible. Again, this is with teams game planning for his running ability. Josh Allen is now the leading rusher of the Buffalo Bills in just 8 games started. Josh Allen also broke Michael Vick’s record for rushing yards over a 3-game span today. I don’t think anyone ever thought that record would be broken considering how prolific of a runner Vick was. They did recover a fumble, but woof, that was awful. I almost feel bad continuing to put them on the lows week after week. Almost. Very few lanes to run through, no time for Allen to throw, Allen constantly scrambling. This unit is BAD. And I’m not talking the good Bad. Who’s Bad? The Bills offensive line. Mills is constantly on his back, Groy had one play where he was on his belly laying horizontally across the turf, after a strong start to his career Wyatt Teller is starting to get smoked often. After the game McDermott was again critical, saying, “We’ve got to be able to protect the quarterback and run the football…I know when your quarterback is your leading rusher week in, and week out, it’s not a healthy thing.” I would set the over/under on returning starters to this line at 2. And I am going to take the under on that. Dawkins has struggled and I think he will be the only starter back. White as been elite all year. Last week was his weakest game and now this week will take that place. On the Jets game winning drive it was White that gave up the back breaking 37 yard pass to Robbie Anderson, who he seemed to struggle with all day. I have no doubt that White will rebound, but this week was a rough one for the Bills rising star. The 2017 version of Jones returned with some key drops in some untimely situations. Jones also made a boneheaded decision on the Bills “Philly Special” call when he decided to throw the ball to a covered Josh Allen in the corner of the endzone. Jones could have easily pulled the ball down and picked up the first down, but the heat of the moment (my 80’s references are on fire today) influenced him to throw the ball and the Bills settled for 3 instead of having 1st and Goal, possibly a 4 point swing if they score a TD later on that drive. Not that the Bills have any control over this one, but by the end of the game injures were starting to stack up for the Bills. Let’s hope that Milano avoided serious ligament damage. He was one of the young players that was playing extremely well this year and if he has to miss an entire offseason of work and all of training camp due to an ACL injury this late in the season it would be devastating news. It would be the lowest of lows for the Bills and for a guy who has shown tremendous growth since being drafted last year. We didn’t establish too much in this one that we didn’t know before. The offensive line needs an overhaul, Crossman needs to be fired, Allen is unbelievable with his legs but made some mistakes with his arm. The first of many Allen vs. Darnold showdowns went to Darnold but not because he was the better QB out there today. Let’s get this offense up to par and see where things stand the next time these two teams meet up. Josh Allen was not the reason the Bills lost this game today, he played good enough for them to win, but the team around him had some letdowns at key moments. Three more games and then the major overhaul can begin. Also, the Bills were officially eliminated from playoff contention today, so a new playoff drought has begun. We are officially at 1 year. Something tells me we won’t be getting to 17. 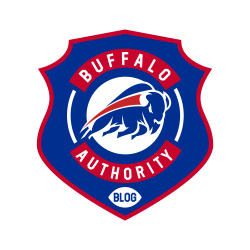 This entry was posted in Analysis, Game Reactions and tagged Bills, Bills Blog, Buffalo Authority, Buffalo Authority Blog, Buffalo Bills, Buffalo Bills vs NY Jets. Bookmark the permalink.